A team of US firefighters from Oregon is visiting Hampshire Fire and Rescue Service to learn about some of its groundbreaking techniques and the variety of work it does. They will take part in live fire training, trial ultra-high pressure lances, compare breathing apparatus, study new search methods and look at different means of ventilation. Hampshire Fire and Rescue Service has helped to develop some of these and is pioneering innovative uses of the latest technology. The visitors will also get to see the work of the country’s leading animal rescue team and the New Forest wildfire preparation division, as well as projects focusing on community resilience and safety. This is the first time the firefighters from Oregon have come to the county. It follows a visit to their service by a team from Hampshire last year. It is hoped this will strengthen an ongoing relationship in which the two services can share expertise and develop new skills. 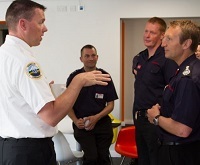 Station Manager David Hodge said: "In the fire service you are always learning and trying to be better. "We aim to be the best. You can’t do that by staying within your borders. You have to find out where the experts in each field are and see how they do things. "Our trip was useful in learning about their approach to wildfires, dealing with a major incident and community work. "We were working with some people who were involved in incidents such as the 9/11 terrorist attacks and the 2003 Space Shuttle Columbia disaster, but what we learnt may impact on how we deal with floods and severe weather. "The value of this hands-on experience and new skills you learn cannot be replicated by reading a manual." While the Hampshire group were in the US they formed part of a team that battled a 75,000-acre wildfire – the largest burning in the country at the time. In Hampshire, the US crew will be integrated into station watches in Portsmouth and Southampton, and experience top-level command assessments. They will also meet the chief officer Dave Curry, take part in discussions on tactics and attend a Hampshire Fire and Rescue Authority meeting, as well as consider the firefighting considerations for an area with dockyards and castles.